Is it something to do with Fergie’s famous hair dryer? No. Was it a case of mistaken identity, Martin? The Sun has an “exclusive”. It says Manchester United have sparked “PANIC” at Spurs. The Red Devils want to take Mauricio Pochettino from White Hart Lane to Old Trafford. Spurs bosses are “edgy” and “concerned” that Pochettino will leave the club and head to Manchester United. They need not worry. 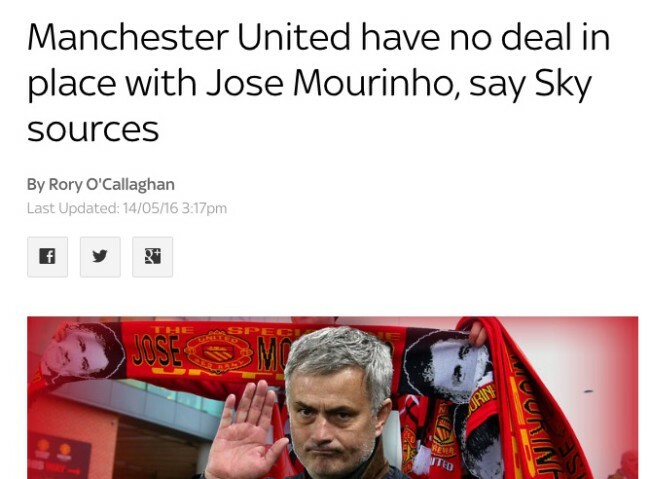 After all the Sun has told us over and over and over that Jose Mourinho is United’s next manager. 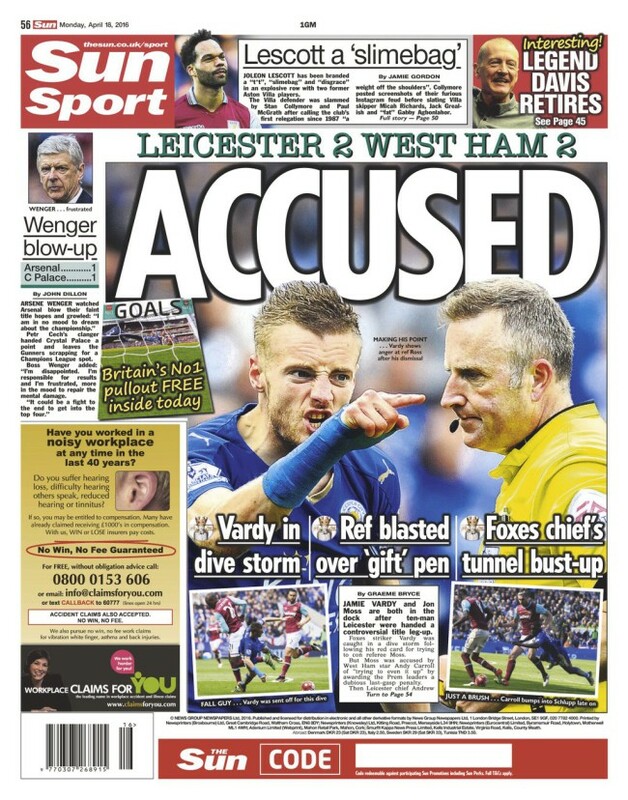 Atop Press: Sun Panic that all its exclusive news has been utter balls. The Guardian says Bayern Munich and Real Madrid are looking to buy Tottenham striker Harry Kane. The story contains not a single fact, quote or source. It is classic transfer balls. This summer will be busy for Kane news. Kane earns £50,000 a week at Spurs. Surely Barcelona and Bayern will top that, reasons the Standard. The Week chucks in another team, saying Real Madrid manager Zinedine Zidane “has identified Kane as the man to lead the line next season.” You’ve got to love “identified”. It implies that Zidane has studied Kane for promotion to the big time. Kane is the Premier League’s top scorer. Identifying his talents is marginally less tricky than looking at a puppy stood by a pile of poo and working out whodunnit. And then there’s Manchester United. 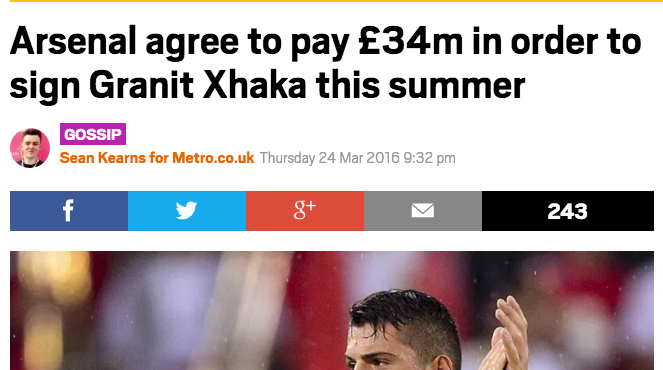 Earlier in April, the Indy said Kane “could regret turning down transfer”. Well, so said Teddy Sheringham. Looking at Kane flying high with Spurs, you have to wonder why he would leave the club. 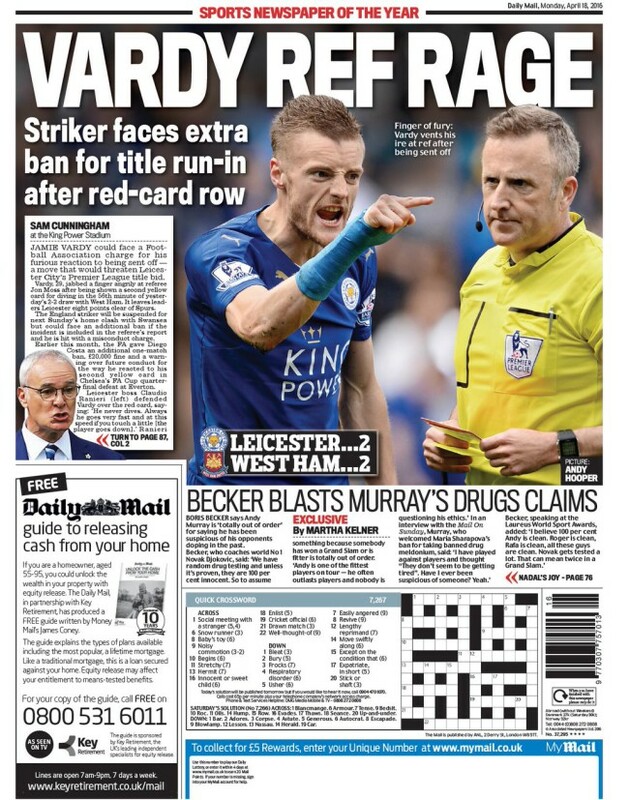 The Mail says Vardy “jabbed a finger angrily at referee Jon Moss”. He did. But not in the picture the Mail leads with. 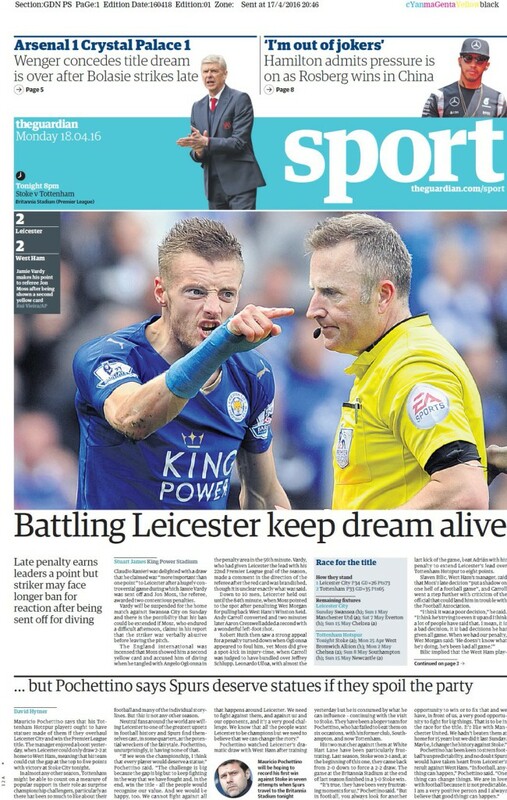 It’s all matter of perspective, much like Ranieri’s vision. Manchester City will play Real Madrid in the Champions League semi-finals. The Sun and Times are debating matters. “Ronaldo and Co con’t scare us,” says the Manchester City manager, Manuel Pelligrini. But they should scare you, says the Times. Manchester United have called “time” on Louis Van Gaal’s career at Old Trafford. 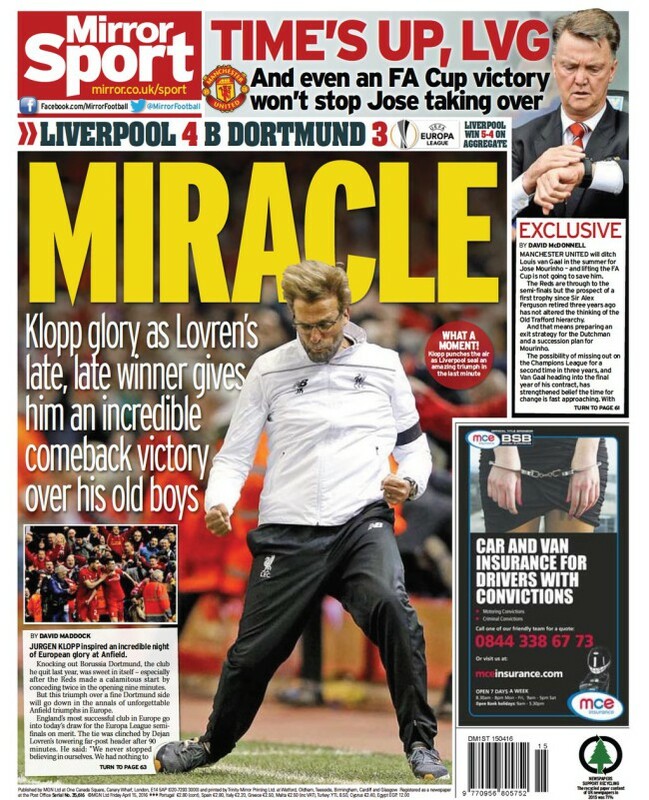 So says the Daily Mirror, which adds that “even an FA Cup victory won’t stop Jose taking over”. David McDonnell says the Manchester United “hierarchy” are plotting an “exit strategy for the Dutchman and a succession plan for Mourinho”. The Mirror, of course, is guessing. 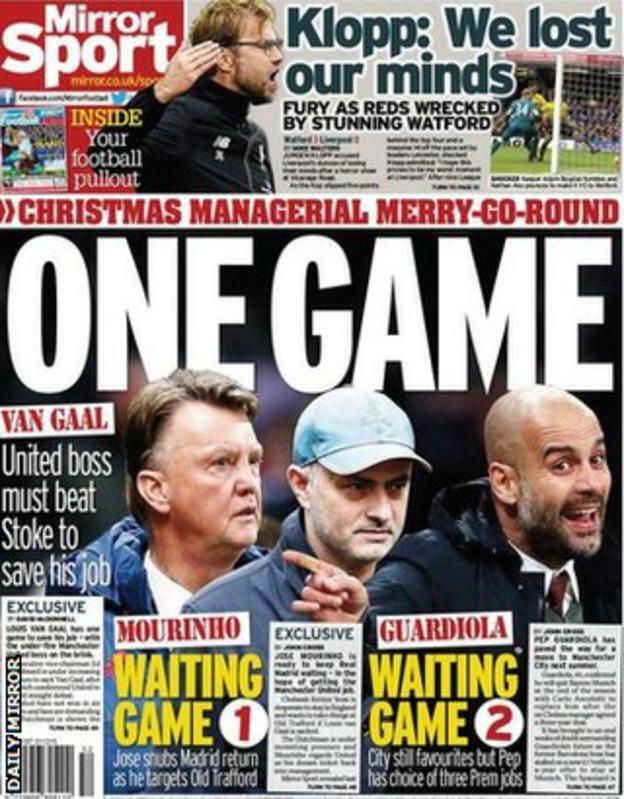 This is the paper that told readers Van Gaal would be sacked should United failed to beat Stoke City. They failed. Van Gaal stayed. Reading on we learn that the “exclusive” news of Van Gaal’s demise is not all that certain. There is a “belief the time for change is fast approaching”. And “there is a growing belief at the Reads they will soon have to strike a deal” to pay Van Gaal off. After so much believing, it’s worth looking back at what the Mirror said yesterday, “Louis Van Gaal has a remarkable knack of getting a result when he needs it most…. He is either incredibly lucky or has a magic touch.” Or else he’s playing Stoke. 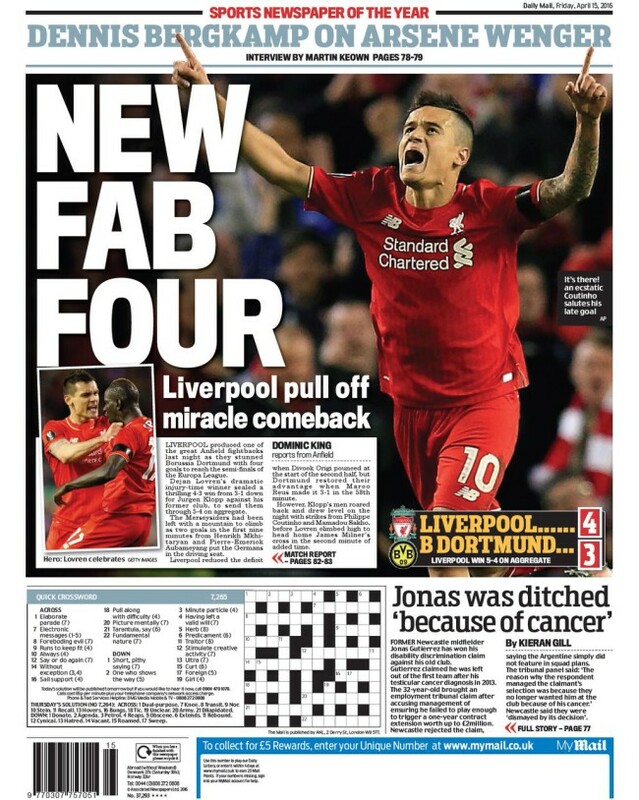 The Mirror writes him off and then says we write him off at our peril. “CLUELESS,” says the Sun in its appraisal of Manchester United manger Louis Van Gaal. And the players agree. They “labelled boss Louis Van Gaal ‘clueless’ in an amazing dressing-room inquest”. 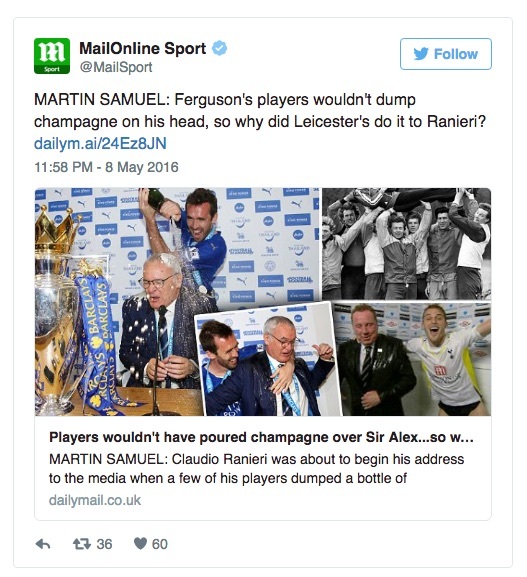 A “source” says the players “didn’t seem to have much time for him” following their 3-0 defeat at Spurs. The Times has more, writing in “stars sick of being blamed by Van Gaal” that the board is split over keeping Van Gaal, or replacing him with Ryan Giggs or Jose Mourinho. It’s a lack of clear thinking and direction that surely undermines United. As Manchester City plot a direction of travel with their recruitment of Pep Guardiola, United dither. 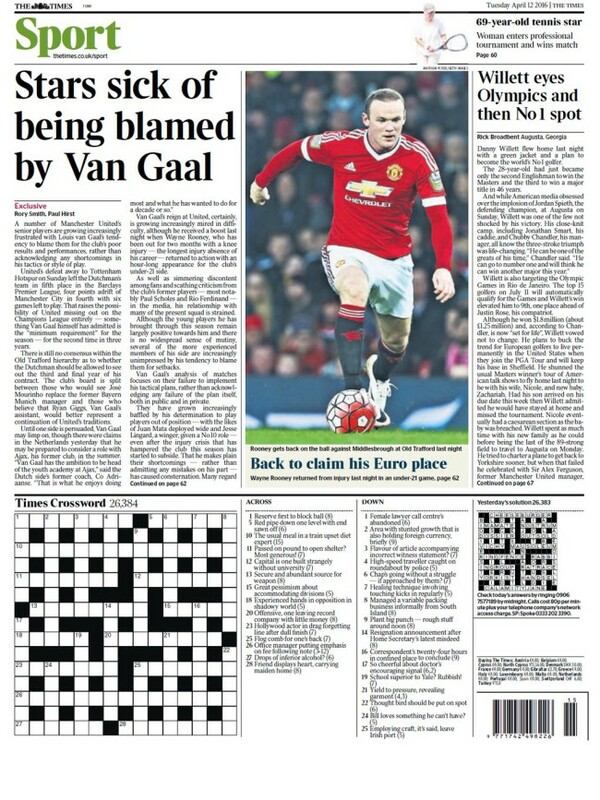 The Times says, until things are sorted out, Van Gaal may limp on”. But the Mail says Van Gaal is “likely to leave United at the end of the season“. Is that why he has been talking about transfer targets? You could argue that money played a factor, what with Arsenal unable to match their rivals’ spending. 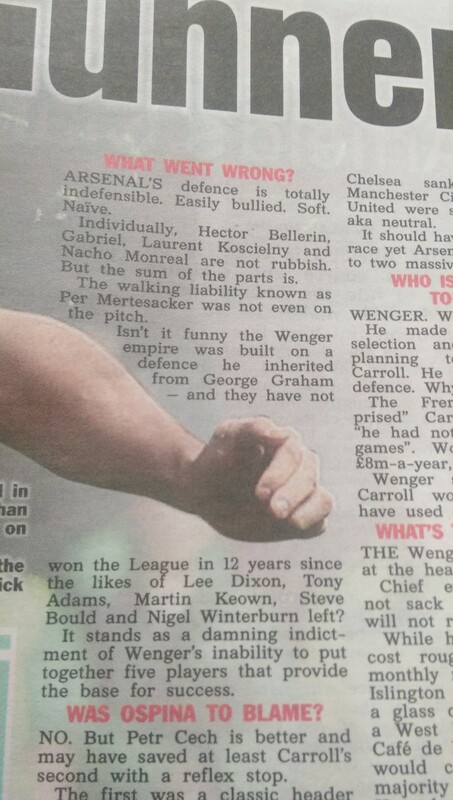 Or you could just find it funny how the Sun’s man in the know knows nothing. 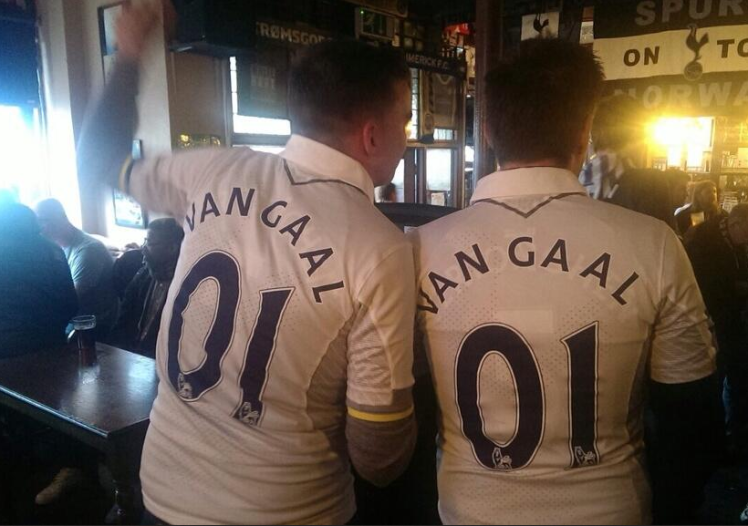 Spurs fans celebrating a rare 3-0 win over Van Gaal’s Man United must be gutted. They could have had hammer-headed Van Gaal and his ego instead of young Mauricio Pochettino and his vision. How far United have fallen to be “in the race” for fourth. 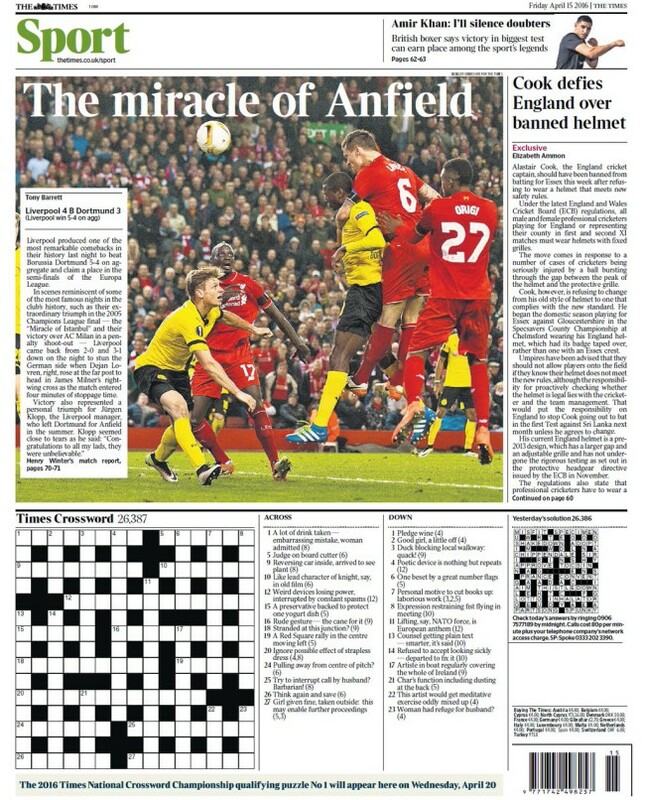 They are, says the Times, “clueless”. 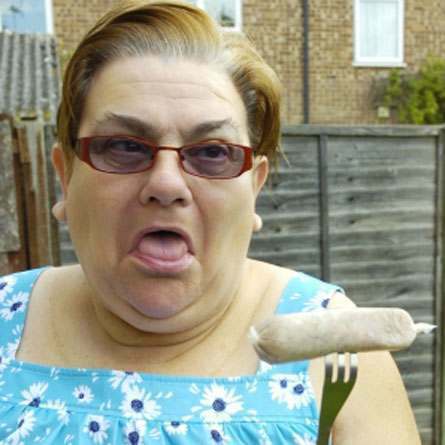 Their capitulation more akin to the Spurs of old. Spurs, meanwhile, can dream of winning the title for the first time since President Dwight D. Eisenhower announced that the United States has severed diplomatic and consular relations with Cuba. Tottenham have scored the most goals and conceded the fewest in the Premier League this season. Six teams have achieved that in the Premier League era. Five times – Manchester United in 2001 and 2008, Arsenal in 2004, Chelsea in 2006 and Manchester City in 2012 – that team won the title. 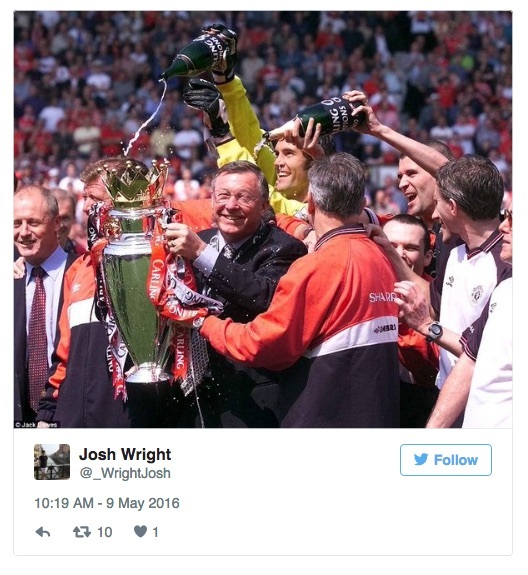 On the other occasion, United finished second in 1998. Big news in the Sun that Tottenham striker Harry Kane has “urged” manager Mauricio Pochettino to remain at White Hart Lane and snub any move to Manchester United. 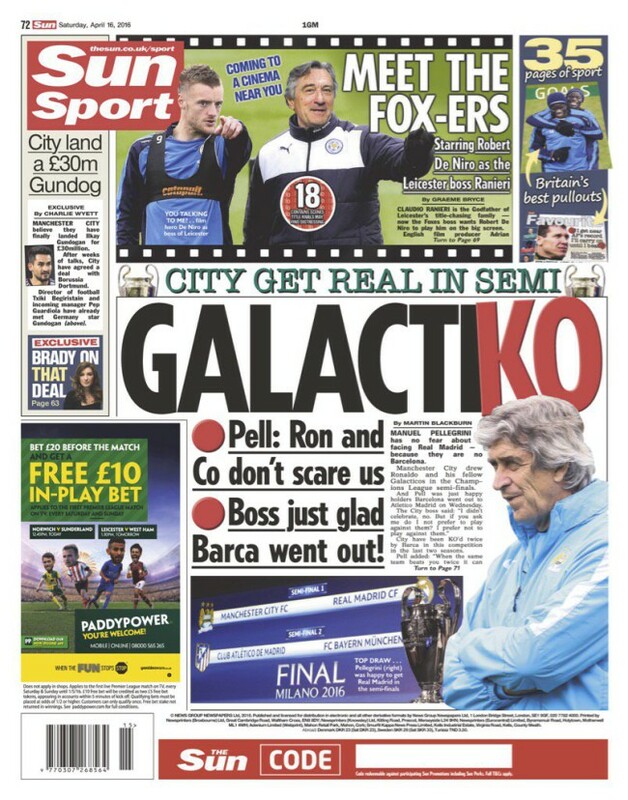 Save the urges, Harry, The Sun says Mourinho’s already got the job. Of course, those figures are wrong. The top-paid players – Wayne Rooney – will lose a lot more bonus pay than, say, new blade Marcus Rashford. The Times has learnt. All players receive a “standard” wage packet when they sign a professional contract at the club, and with Champions League qualification, they receive a larger wage packet, known as the “standard plus” rate. United introduced the scheme after the departure of Sir Alex Ferguson, sensing perhaps that the team would not be so assured of qualifying for the Champions League as they were under the Scot. Reduce the manager; reduce the wages. Hold the back page! 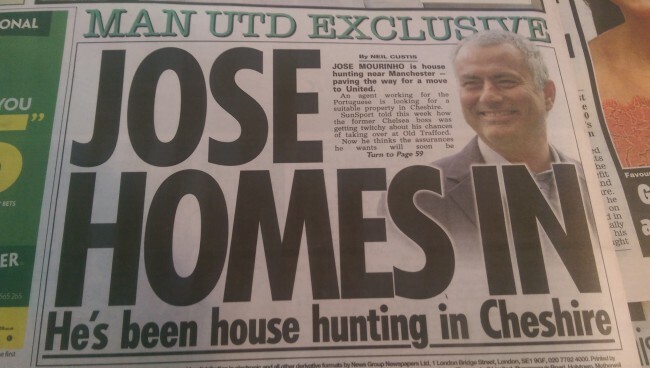 No sooner has the Daily Mirror given Manchester United manager Louis Van Gaal a “boost” with news that Jose Mourinho is being courted by Real Madrid than the Sun screams: “JOSE HOMES IN – He’s been house hunting in Cheshire”. The story goes that an “agent” is acting on Mourinho’s behalf, on the look out for a suitable pad in Cheshire. What kind of agent is not said, but our bet would be on it being one involved in getting Jose the top job and any fat fees that go with it. The Sun adds that Mourinho has a “verbal understanding that he will take over from Louis Van Gaal at the end of May”. But the Mirror says Manchester United’s main dealmaker, Ed Woodward, “is keen to keep Van Gaal”, who is “expected to stay in his job if United qualify for next season’s Champions League”. We aren’t told with whom Jose has a “verbal agreement” but if it is with an estate agent, we’d advise going for something more binding lest he get gazumped. 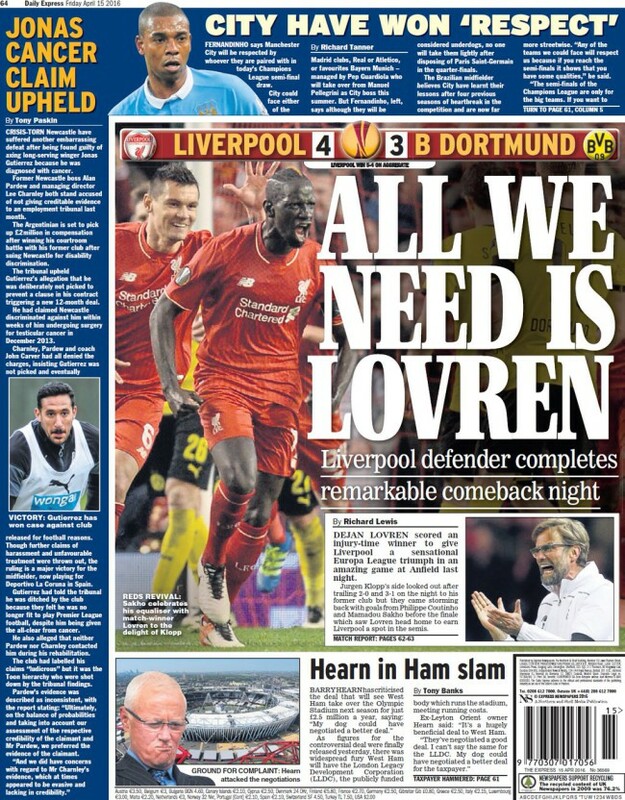 The Daily Mirror says Manchester United are on “red alert”. The story is that Real Madrid are “plotting” to rehire Jose Mourinho. 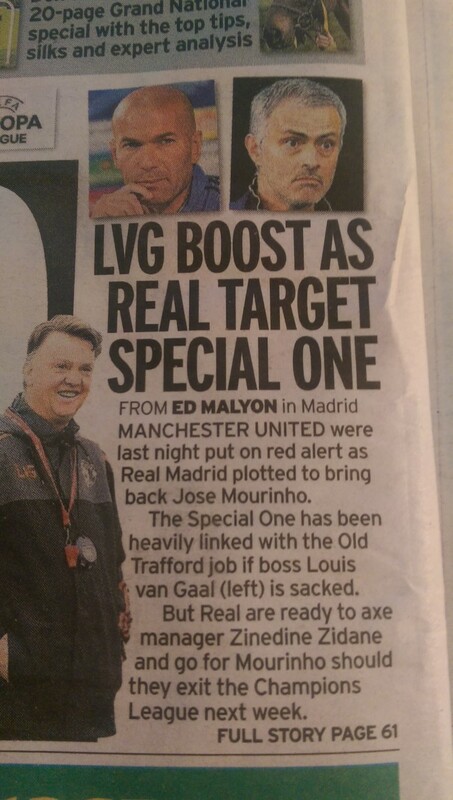 This, we’re told, is a “boost” to current Manchester United manger Louis Van Gaal. This Mirror adds that Mourinho has been “heavily linked with the Old Trafford job”. But who needs words when you can have a smile? You can read those predatory paparazzi-scoops and many more like them in the, er, Daily Mail. 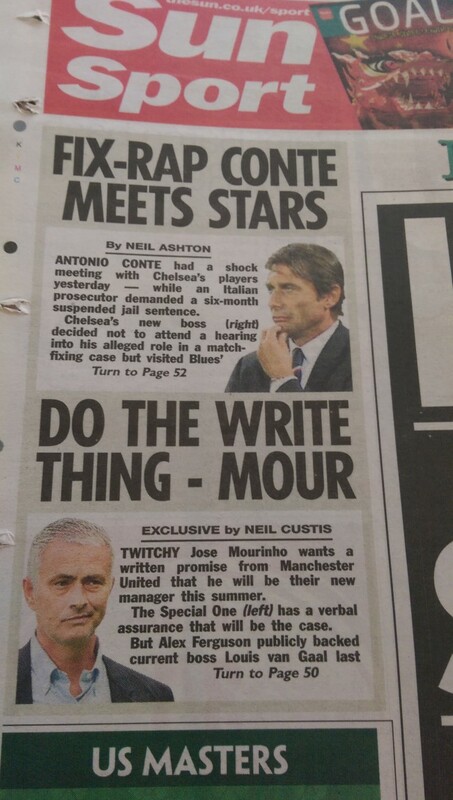 The Sun says Jose Mourinho wants a “written promise” he will be their manager this summer. A written promise? Isn’t that a contract. 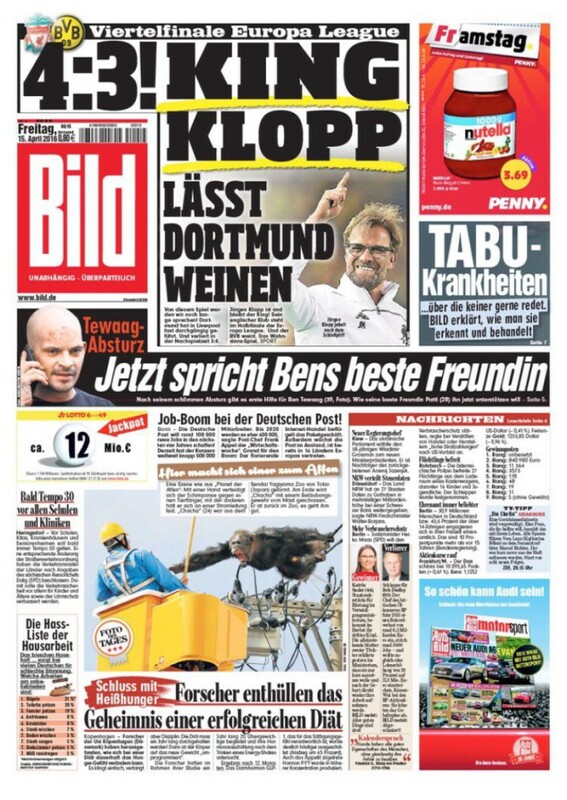 Indeed, one slot above Mourinho’s request is news of Antonio Conte, who will join Chelsea as their new manager in the summer once he’s finished working with Italy. He has a contract. Jose Mourinho does not. He sounds desperate. Surely Manchester United hold all the cards. They are the Premier League’s richest and biggest club. Is Jose’s the only name in the frame for such a great job? Would United fans really pick him over, say, Diego Simeone, Laurent Blanc and Louis Van Gaal? In the Mirror, news is that the Dutchman thinks he will stay on as United boss even if he fails to get them into the Champions’ League. But the Sun is backing Jose. It says United’s owners, the Glazers, “know he is the man to take them back to the top”. Just as, one presumes, they knew David Moyes and Louis Van Gaal were the right men. 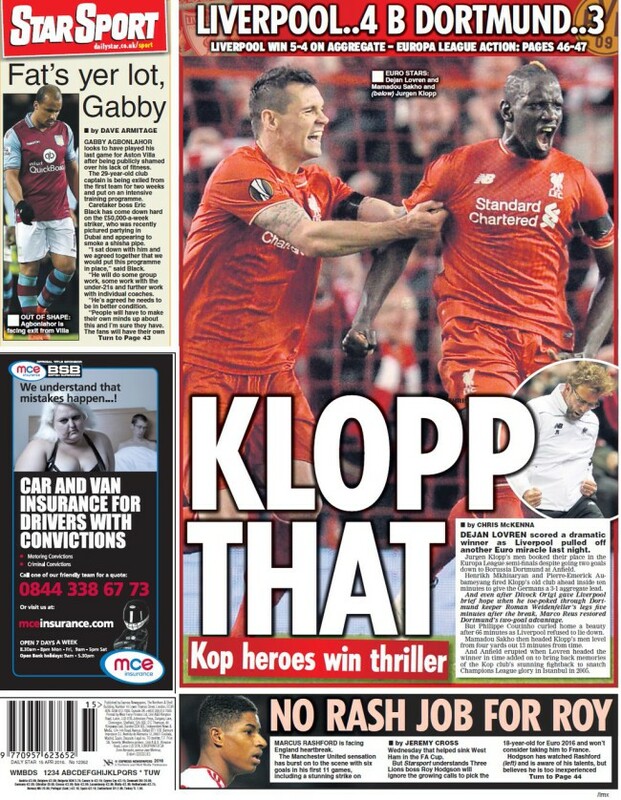 The Daily Express has news for Manchester United fans. Jose Mourinho has been offered the Syria job. No, not to run the country and take on the jihadis and the lunatic dictator Assad. Mourinho has been offered the chance to manage the Syrian football team. 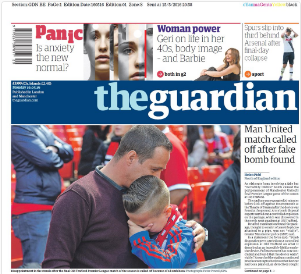 And how is that classified as “Manchester United news” when neither Mourinho nor Syria are in Manchester? While Conte is also pushing for the addition of Roma’s Belgian midfielder Radja Nainggolan, who is available for €35m, and further experienced defensive cover such as Leonardo Bonucci, Kostas Manolas, Kalidou Koulibaly and Antonio Rüdiger have been scouted at Juventus, Napoli and Roma respectively, where the latter is on loan from Bayer Leverkusen, it is perhaps telling he is to adopt the title head coach rather than manager. That would appear to reinforce Emenalo’s position at the club despite Chelsea’s patchy recent record on recruitment. The Mirror says Conte will get shot of John Terry and Thibaut Courtois, replacing the latter with Southampton’s Fraser Foster. 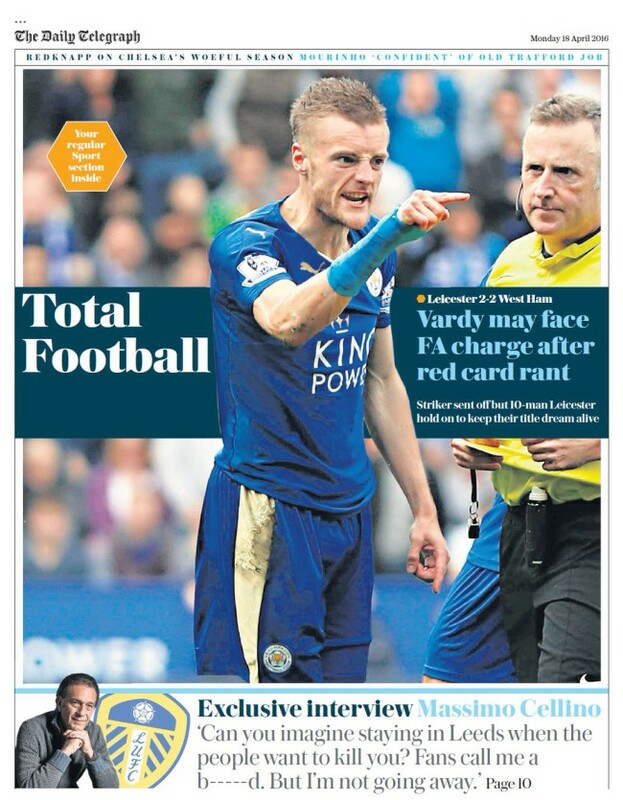 The Times points to Everton’s Romelu Lukaku making a pricey return, Edinson Cavani, Gonzalo Higuain and Artuo Vidal. 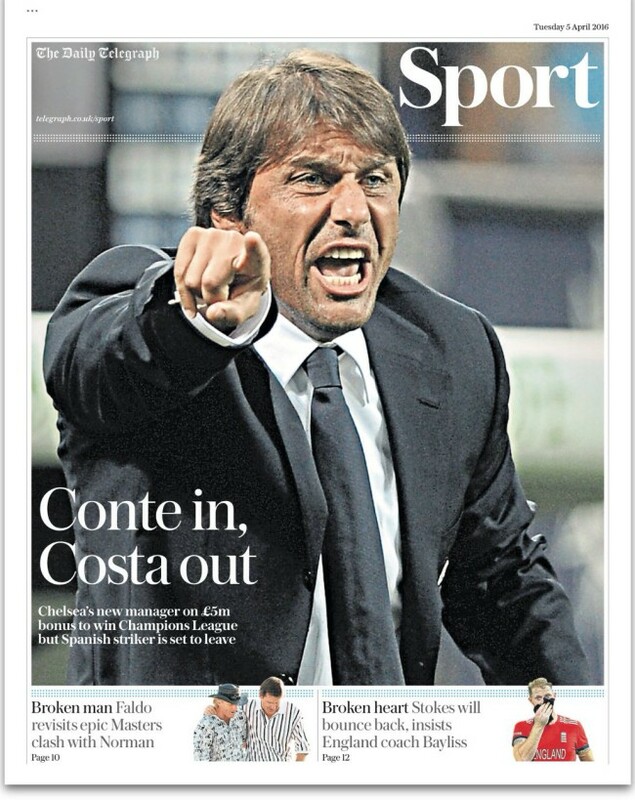 But Conte’s “top priority” (Mirror) is keeping Diego Costa. The Sun says Conte will “demand, discipline, decency and respect”. He might consider recruiting a psychologist to get Costa to fit the mould. And then order a personality transplant for the sneaky striker. But not matter because the Telegraph says Costa’s on his way to PSG. And Conte has another pressing issue, says the Mail in the lead story “match-fix trial dogs new Chelsea boss”. Conte’s legal team were in court in Cremona on Monday for the latest hearing of the match-fixing trial in which he is embroiled. It continues on Tuesday, when he will learn if the prosecution are seeking a fine or a prison sentence — though the latter is unlikely. Conte maintains his innocence and a decision is expected by mid-May. If any fine is linked to his salary, you wonder what newspaper the judges will use as their source?